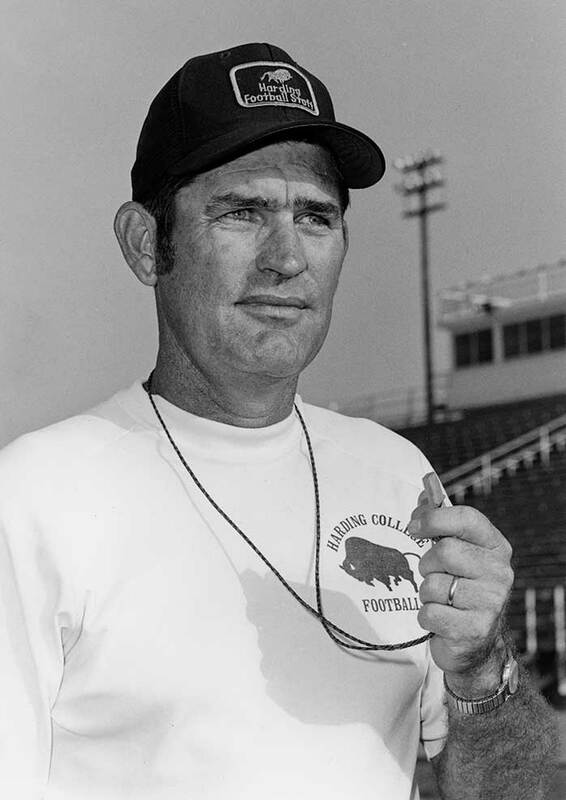 Even after nearly three decades since he walked the sideline, it’s hard to discuss Harding University football and not mention John Prock in the first breath. 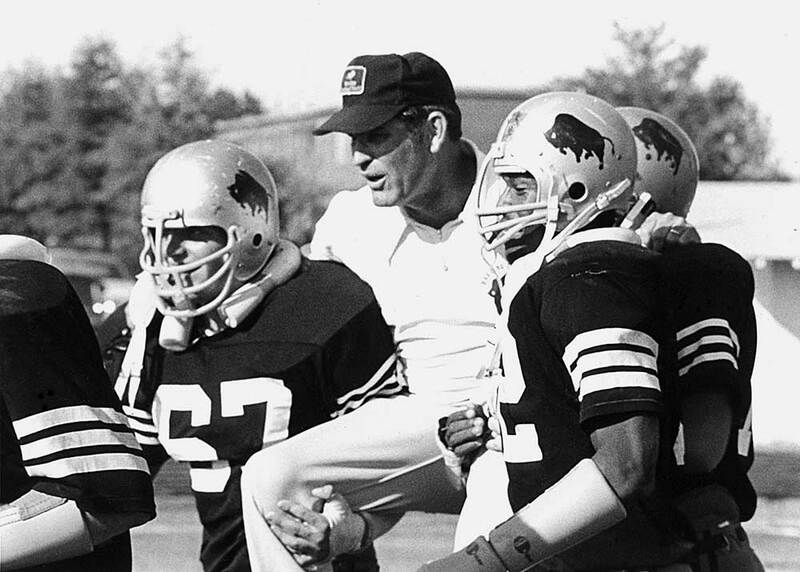 For two generations of players, from 1960 to 1987, Prock was the heart and soul of the Bison program. But before he arrived at the small Christian college, the late head coach faced adversity as a youth and was shaped by his grandmother’s faith, his father-figure coach’s compassion and his wife’s loyalty and support. Born March 13, 1929, Prock’s southwest Oklahoma roots were covered with the dust, dysfunction and poverty of the Great Depression. His mother tragically died when he was two years old. He lived with his paternal grandparents, neither of whom could read nor write, in a one-room house without electricity or indoor plumbing. He regularly read the Bible to his grandmother by lamplight. When Prock’s grandmother died when he was 12, he moved in with his father and stepmother, thus beginning the darkest chapter in his young life when his stepmother frequently and maliciously abused him. At age 14, he escaped the constant pain and conflict when he moved out of the house into a small building in the backyard and was virtually on his own. It was around this time that Prock’s junior high football coach, Joe Bailey Metcalf, took him under his wing. A stern disciplinarian who served as a father figure to many of his players, Metcalf coached Prock in junior high and high school in Hollis, Oklahoma, and college at Southwestern Oklahoma State. 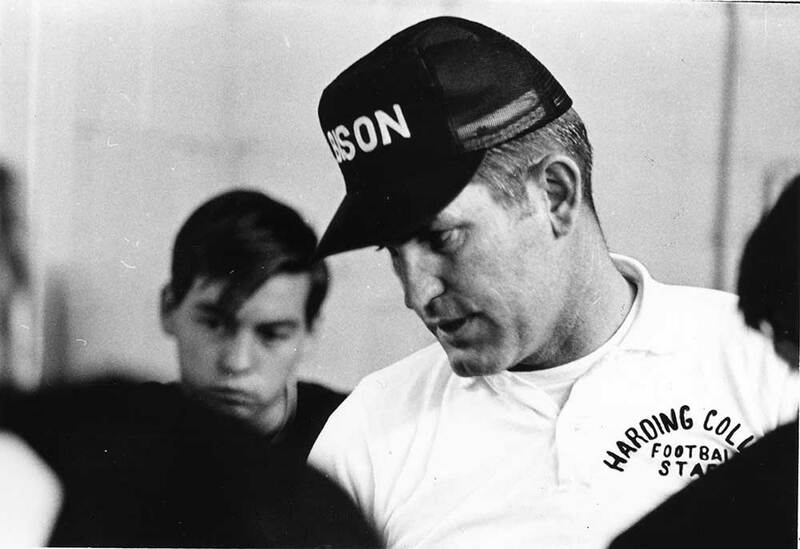 He mentored and shaped not only Prock but every young man who played for him, including legendary Texas Longhorns coach Darrell Royal and Kansas University basketball coach Ted Owens. Early in Prock’s senior year at Hollis High School, he paired up with a popular junior co-ed, Charlene Knight, on a chance encounter when, in fact, she was actually pursuing one of his best friends. They stole watermelons that fateful first date and were married less than a year later, beginning a love story that lasted 64 years. 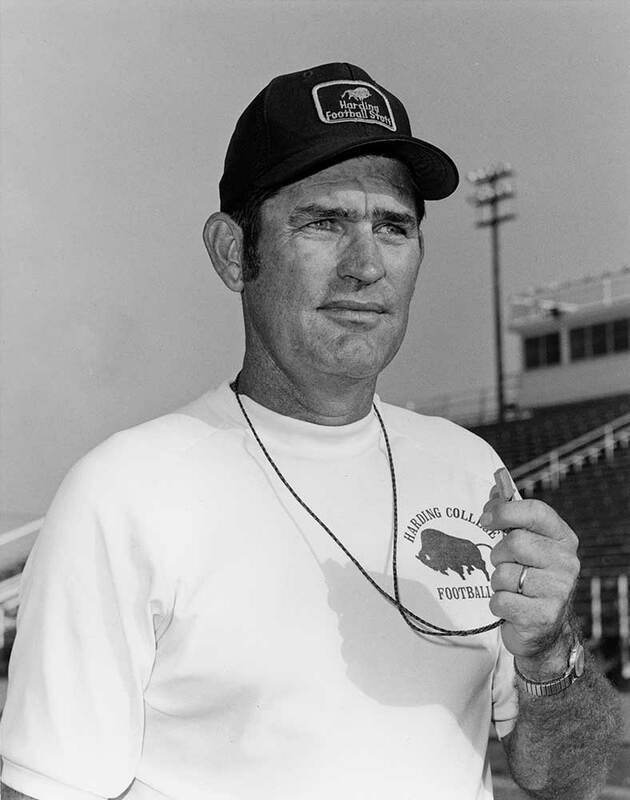 Charlene was his biggest supporter and life partner as he tracked a coaching career that eventually took him from the Oklahoma high school ranks to Harding College, where he worked with Oklahoma Sooner all-star Carl Allison to build the Bison football program from the ground up in 1960. 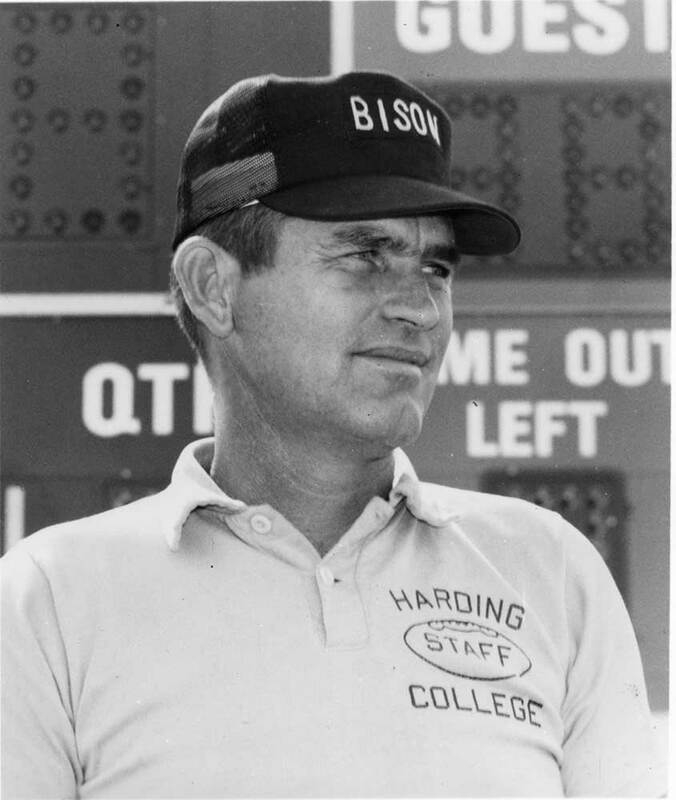 When Allison departed Harding in 1964 to return to the University of Oklahoma, Prock was named head coach and proceeded to lead the Bisons for 24 years until his retirement in 1987. Along the way he won two Arkansas Intercollegiate Conference titles, earned three Coach of the Year awards and mentored 10 All-Americans. Once his career was complete, he was selected into membership of five different athletic halls of fame. As Prock entered retirement, his focus shifted from football to two of his passions: his family and his hobby, woodcarving. “Papa Camp” created lifelong memories for his eight grandchildren, and he closely followed the high school coaching careers of his son, Cam, and son-in-law, Ronnie Peacock. If he wasn’t playing with grandchildren or following football, Prock was in his woodshop carving Santas, football players or bisons. His handiwork was prolific; he carved and painted more than 100 Santa figurines after he retired from coaching and teaching. In 1999, Prock’s physical motor skills quickly began deteriorating and eventually his cognitive abilities eroded. Doctors diagnosed him with Lewy Body dementia, a degenerative form of dementia that was likely caused by the concussions and collisions he experienced as a high school and college football player. Sadly ironic, the life preserver that saved him from his impoverished and abusive childhood, provided his college education and eventually became his passion and a 33-year career, eventually stole away his life. His beloved Charlene became his caretaker as he slowly slipped away.